We offer your company our on-site fitness classes for as many times and many days a week as you like. 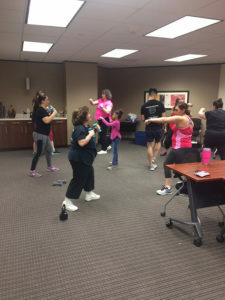 Our classes are for as many as 40 people or more and as little as 2 people. We know that companies like you strive to always give something to your employees to show your appreciation for them and their daily hard work. One of the most important gifts you can give your employees is an opportunity to achieve optimal health. That’s where our on-site fitness classes come into play for your company. Our corporate fitness classes are designed for everybody and every level, whether your employees are beginners and never worked out a day in their life or they are in tip top shape and workout everyday. Our fitness classes provide your employees with workouts that can help them get into better shape, have more energy throughout the day, be more productive, and create team bonding to use in the work place atmosphere. Our group fitness classes that we provide to your company are only 30 minutes long because we know that you and and your employees have a lot going on in life. You got work that needs to be completed, you have family to be around, friends and animals. The last thing you need is a hour long class that delays you from the other important aspects of your life. We bring our group fitness classes to your site, we have top tier trainers, equipment and workouts that can be conducted in as little as 300 sqft worth of room. We do this so that your employees don’t have to leave work and go into traffic just to get to an overcrowded gym. We save you and your employees at least 1 hour of time that can be used to be home and around your family and friends. Our workouts that are fit for every fitness level consist of strength training, core and cardio. Each section is completed within 8 minutes and everyone gets time to rest and rehydrate before each section. 30 minutes of workouts and your done, off to your family friends and loved ones.